Your company is growing and it's becoming more difficult to keep up with your employees. How do they really feel about their jobs, their managers, the organization, and even you? They have valuable feedback and they want to share it. But are you harnessing it properly-to get deep insights, lead like never before, and achieve full potential? Easy to use, flexible, and cost effective. 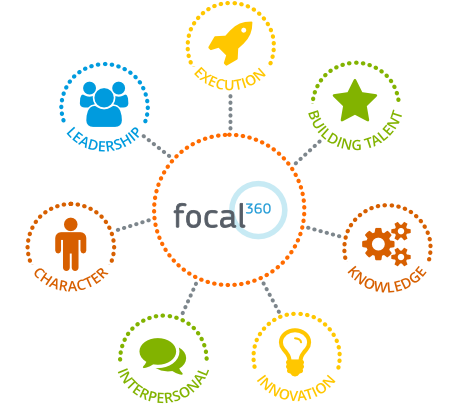 Focal 360 is our industry leading comprehensive 360 degree feedback solution designed for groups or projects of any size. It is easy to use, flexible, and cost effective. Conduct 360 degree feedback with minimal effort and maximum impact with our Focal 360 online software system. The entire process is streamlined and automated. We offer pre-defined questionnaires and a general leadership model that is statistically validated and benchmarked. Alternatively, you can load your own survey template or competency model into our 360 software. Assess employee engagement level, satisfaction, and organizational effectiveness. 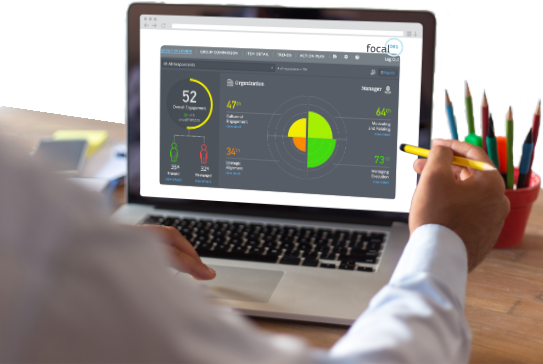 Focal ORG is a powerful employee survey and online dashboard that measures the level of employee engagement, satisfaction, alignment, and organizational effectiveness. Identify, understand, and fix employee engagement problems throughout your organization with actionable results that have more depth, more precision, and are easier to navigate and understand. "I would highly recommend the tool from a manager's standpoint due to easy administration, automated reports, and timeliness. CustomInsight was very easy to work with and their response rate to emails was incredible." "We are super happy! This is going to be a game changer for us. We had very good participation and the tool has been fantastic. Your personalized service has also been fabulous and has made this so easy for us." "We had an awesome response from our employees, saying that this was the best survey they've taken. And our CEO was blown away by the data he now has at his fingertips and how actionable it is. We are very impressed and will definitely recommend the platform." "Your employee feedback system has been transformational for our business. We have come back to it again and again, and would have made bad decisions without it." Focal 360 is online software (SaaS) for conducting 360 degree feedback evaluations. We offer complete 360 questionnaires, or you can load your own survey questions, template, or competency model into our system. The process of setting up your questionnaire, collecting survey responses, and downloading reports is fully automated with our online software solution. 360 Degree Feedback is a process where people receive confidential feedback from their managers, peers, and direct reports. The feedback is focused on workplace behaviors and competencies, and usually includes both numeric ratings as well as written comments. Who should receive 360 degree feedback? Most companies use our software for manager feedback, but the 360 process is not limited to just management. All employees can benefit from receiving candid feedback on their job performance and workplace behavior. Teams can benefit from increased communication and openness. What are the benefits of 360 Feedback? 360 Feedback is an inexpensive and effective development tool. It provides a way for people to get a better understanding of their strengths and weaknesses and how their coworkers perceive them. Feedback results can be used to create an informed development plan that focuses on the areas that are most in need of improvement or change. Focal ORG is online software (SaaS) that helps you understand the drivers of employee engagement and satisfaction at your company. The process starts with a questionnaire that measures engagement as well as alignment with company strategy (company goals and strategic objectives). Once the survey is complete, results are provided in an online dashboard that highlights the drivers of engagement and any areas in your company that have low levels of engagement. We define employee engagement as the extent to which employees feel passionate about their jobs, are committed to the organization, and put discretionary effort into their work. The elements that drive engagement typically include respect, trust, fairness, communication, teamwork, and similar topics. Our model of engagement is based on statistical research, which consistently breaks down into three factors - engagement with the organization, engagement with direct supervisors, and strategic alignment. Employee Satisfaction is not enough. Satisfaction only addresses basic employee needs. It looks at how happy or content employees are. Satisfaction falls short because it does not address employees' emotional commitment or involvement. From our support centers around the world, we offer unlimited technical support by phone and email.